Comparable To: a fast paced R-Type, a less demanding Stardust, or an immensely simplistic Enter The Gungeon. This game has the looping battle arena of Odin Sphere, the anachronistic experimental tech of the classic 194X series, and the general layout/feel of a beefed up Asteroids with gravitational pull. 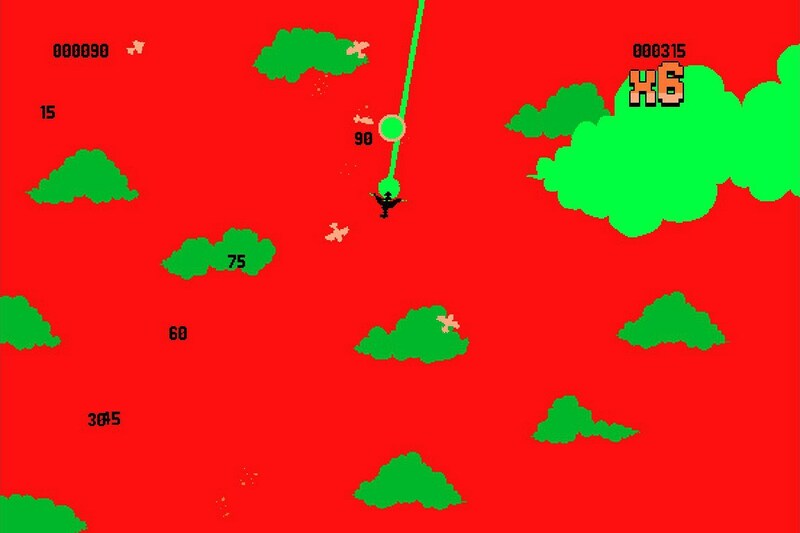 Story: Ask yourself if you need a reason to down thousands of 8-Bit planes. If the answer is “yes” move along. Move along. Presentation: There are 3 static UI screens and an active battlefield. Technically 9 enemies exist though shorter runs will likely ever witness 3 or 4 of them (and one tough enemy has a 2% spawn rate). Every death has you start the music track from the beginning so all these statistics I’m slinging culminate into a game composed of a flurry of action, punctuated by repeated visuals and clipped MIDI-quality trills and blats. For certain, the novelty of exploding 2D silhouettes against a vanilla sky will grow tiresome though probably considerably after the one looping battle track begins to wear thin. 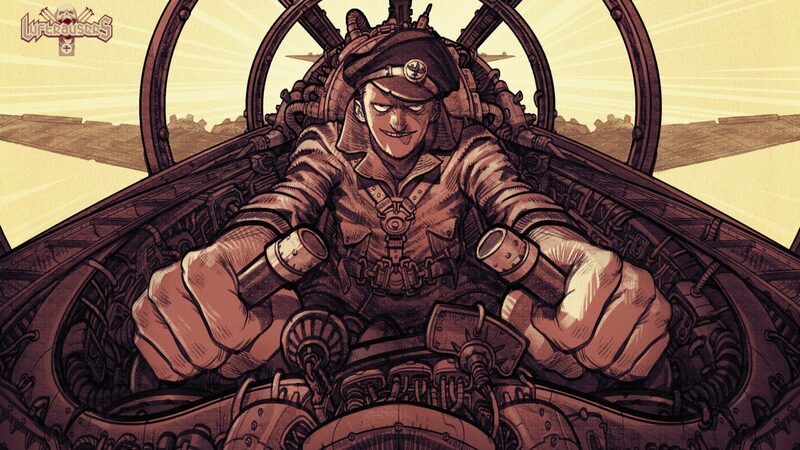 Small fighters zip about, destroyers float ineffectually, battleships lurk, opposing aces duck and roll in the same manner as the protagonist, submarines surface then flee, while the massive zeppelins spew death off-screen. In all honesty there isn’t much to it visually though the minimalist style is very appealing in small doses and caters to my sense of order, before it blows me out of the sky with a hail of white-hot balls of flame. All in all, there is a coherent balance of on-screen mayhem and intentional contrast. Unlockables exist to change the monochrome color palette though it’s soon obvious that the developers chose the ideal combination. The others irritate me greatly. Unique Features: I don’t recall ever playing a SHMUP with gravity. This feature instills credibility to the dog-fighting theme as your Frankensteined plane dips and soars with the counteractive forces of both the ground and heavy weapons fire altering the trajectory of ballast and bullets in an interesting way. With practice, giving the right amount of thrust to pull off an aerial maneuver that correctly leads a shot to destroy a plane in mid-air is immensely satisfying. Of note: there are 5 weapons, 5 body, and 5 thrust types which are interchangeable, equating to 125 distinct planes to fly – each with their own developer-given name. 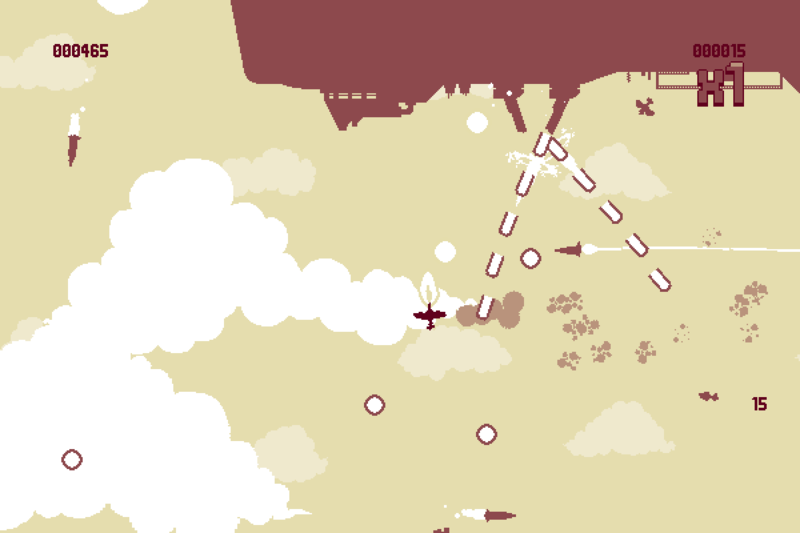 Gameplay: The introductory minutes go something like this: boot game, Luftrausers splash screen and opening track, ship build selection, submarine launch of the ill-fated fighter along with the primary battle hymn, kill 5 aircraft, kill a couple destroyers, an ace or a series of battleships show up, get wrekt. Rinse and repeat. Recognize that gravity dictates your attack patterns and momentum, and that you cease fire to gain hp. Git gud through experience and then…. 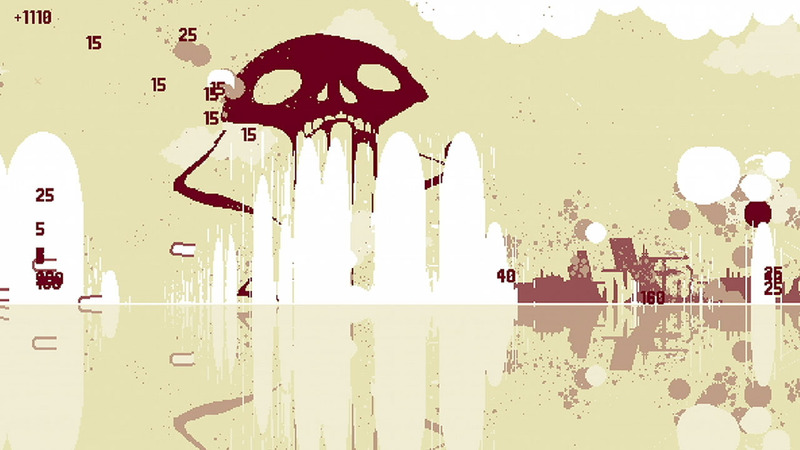 continue to be blasted apart in under a couple minutes except that you might experience a blimp, submarine, or [rarely] a “laser ace” that obliterates from somewhere off-screen. If the player is undeterred by their short survival -even after turning pro- they’ll look to tackle individual challenges for the 15 plane parts + “Random”s for either the weapon, body, or thrusting mechanism. 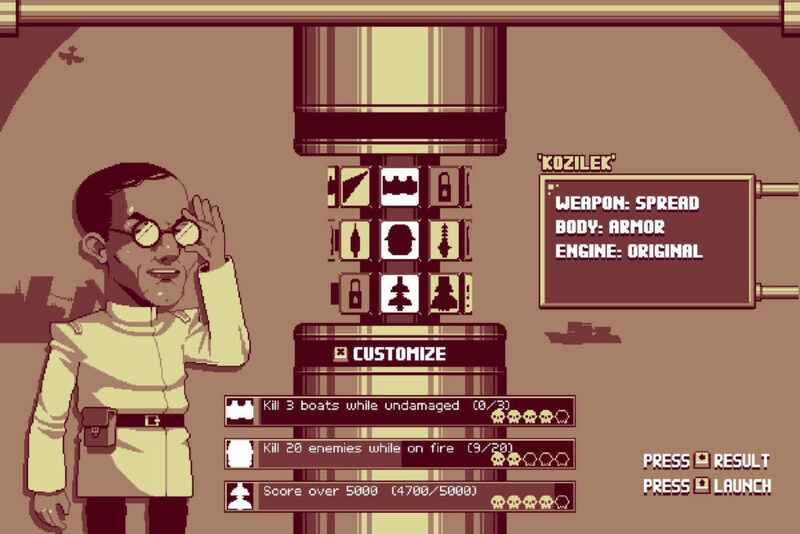 Everything is selectable from the get-go, though the limited and repetitive, score-centric gameplay demands a self-propelled reason to branch out if only to shake up the tedium. I found myself experimenting and actually desiring imperfect builds. There is incredible enjoyment to discovering “new favorite” combinations of the 125 available, “fixing” what wasn’t “broken” so to speak. In realizing a personal time and kill cap were inevitable, I embraced character death as a facet of fun and learned to love the atomic bomb…. er…. flawed creations the game encourages. When first sampling the hoverskirt I thought, “Too floaty. How could I ever utilize this?” Soon, I was making great effect of the anti-grav nature of flitting effortlessly across the screen with a machinegun spewing death in my wake. Slap a melee blade and diving prop on a craft and you’ve got a saw-toothed scourge of those smug, pesky battleships. Put a spread gun on an armor body and you’ve got a veritable wrecking ball that covers the skies with projectiles before colliding into larger targets. A fidgety laser sweeps swathes of fliers out of the air and focuses damage with pinpoint accuracy. Torpedoes drop towards the ocean. Missiles careen wildly into the fray. And when you become all too aware of your impending mortality, equip a “nuke body” to ensure the ultimate word. He who laughs last while disintegrating, something something. Additional Comments: Cannon + Armor + Superboost. “Smalls” 4 Lyfe! My favorite. What I Liked: The whole aesthetic gives a great first impression. Sessions were light affairs of booting the game and wasting a few minutes out of what would otherwise be a boring delay at the car wash or waiting for a friend to pick you up. The gravity physics are a novel idea and the feeling of unintentional plane tricks transcending into essential maneuvers as you squeeze an extra few seconds out of your longest play time is difficult to describe precisely. The difficulty ramps quickly, but perhaps that’s for the best. You develop your favorite loadout but to “progress”, you are soon forced to pick body/thrust/weapon combos that wouldn’t otherwise be considered. It’s enthralling to see how “least bad” you can do in the absence of your ideal. What I Disliked: Appreciation for the repetitive and monotonous audio wanes quickly. Randomness or variety would have gone a long way to combat the gamer ennui that besets those front-loading too much time on the title. I also abhor that my Vita install crapped out and am infuriated after reading reports of the Vita not allowing a final achievement I was missing. I spent 3-5 hours specifically gunning for a dangerous foe that appears in one of every 50 games. Killing that damn “laser ace” did nothing for my challenge completion! Do you guys happen to have an intra-Post Tramautic Stress Disorder ward on this sub by chance? The 64GB memory card and every directory allocated had sufficient space. The error persists, even though I’ve deleted in excess of “0KB” for all seemingly-relevant areas…. On the subject of Vita-specific issues, I later found a platform glitch regarding the possibility of completing one of the achievements. This effectively barred me from unlocking the super-secret craft to finalize the feat. For buyers or those looking to prove me wrong, the achievement is the “Random” body mission to kill a Classified No. 1. Hours I Played: Probably 20+, an estimated 350 sessions. I could tell you with certainty if my game install didn’t get corrupted! My Personal Reaction: It’s a fun little no-risk game. There aren’t many obstacles to unlocking all available content (except one reward) so it’s very much a WYSIWYG that can be played for a few minutes at a time, at your discretion. Noob Tips: Sample all available parts and wrap your head around the idea of having 125 potential combinations. Tool your apocryphal WWII fighter towards destroying battleships since they’re most likely to present the most trouble – don’t fly directly at them and perfect that strafing run. Timing is everything. Don’t push your disadvantage. What military force do we represent again? “Ours?” Good enough.